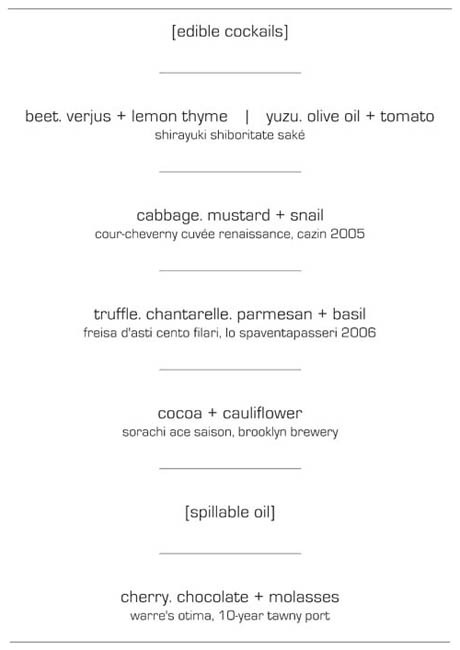 « Foodprinting: Denver & L.A. IMAGE: All photos of the Cross(x)Species Adventure Club dinner by Emilie Baltz. Natalie Jeremijenko is an artist and designer whose background includes studies in biochemistry, physics, neuroscience, and precision engineering. She directs the xDesign Environmental Health Clinic at NYU, where she is also assistant professor in Art. 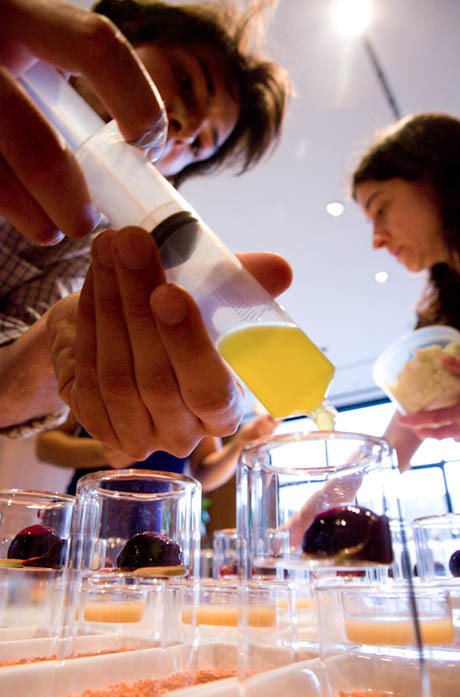 Together with molecular gastronomist Mihir Desai, she organises occasional Cross(x)Species Adventure Club dinners, featuring drinks and dishes that challenge guests to expand their idea of the food web, in order to imagine edible interventions that go beyond sustainability to actually augment ecological health. 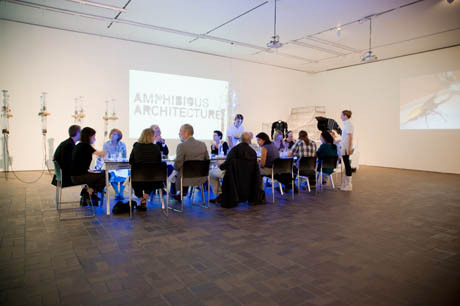 Their most recent Cross(x)Species dinner was held on August 21st, at the Neuberger Museum of Art in Purchase, New York. Although I wasn’t able to attend, I was thrilled to be able to talk through the menu with both Desai and Jeremijenko during a series of fascinating and lengthy phone calls. Our edited conversation, below, provides a tour through the evening’s culinary adventures, from edible cocktails to nano water buffalo ice-cream, diverting frequently to consider, for example, horse-racing as a business model for urban agriculture, and the morality of eating snails. Edible Geography: Your most recent Cross(x)Species Adventure Club dinner had an oil spill theme — can you talk a little about why and how you explored that through the menu? Natalie Jeremijenko: With the enormous spill in the gulf, oil is in everyone’s imagination at the moment. It’s actually a useful way to look at the relationship between multi-scalar processes — digestion inside our bodies and digestive processes that happen in ecology. Oil, of course, is really only digested by bacteria, even inside us. That’s a great way to start the exploration of this idea that there are ten times as many non-human cells in our bodies as there are human cells: we’re more non-human than human. We are an ecology to other organisms. That’s where we began. Mihir Desai: We had a major oil for each course, as a flavour. And, almost by default, virtually all the courses involved an emulsion of some sort, drawing on the properties of oil dispersal in liquid. 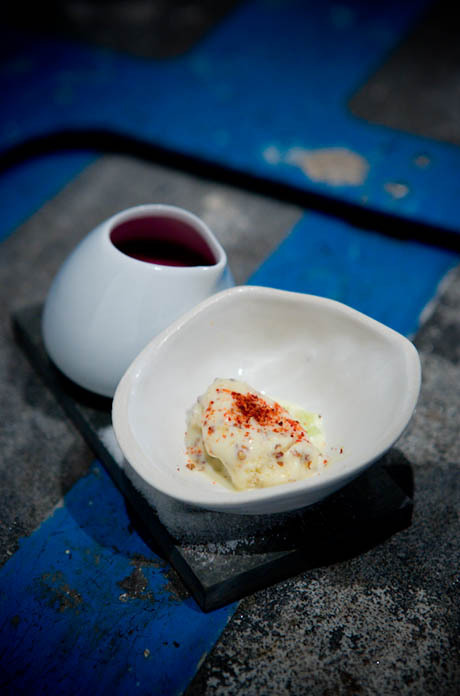 For example, the cauliflower velouté in the fourth course was an emulsion using a fluid gel. I think next time we’ll do even more. I’d like to do a confit — that’s basically anything just cooked in a bath of oil at a low heat for a long time — and perhaps also fry some things. A confit of goose would be really interesting. Natalie’s been eager to serve goose. They’re actually massacring them out in Prospect Park right now. Unfortunately, they’re not in season at the moment. You can only get really old birds, so we’re going to hold off for a bit. Edible Geography: Talk me through the evening, course by course. 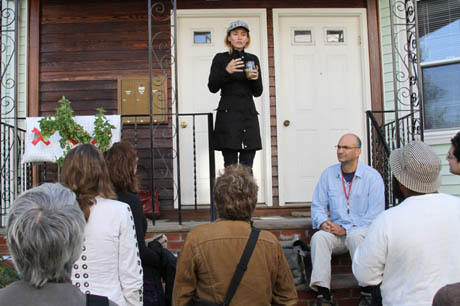 Natalie Jeremijenko: We started off by doing some workshops. What happens in the workshop part is that Mihir and I swap off, introducing molecular gastronomy to people and then talking about why molecular gastronomy is interesting to use as a medium for the Cross(x)Species Adventure Club purposes. Mihir Desai: This was actually a particular interesting dinner for me, because this was the first one where I got to hear a lot of what Natalie says. Usually, I’m going in and out and I miss most of it. Natalie Jeremijenko: The dinner began with three edible cocktails and one wetland experiment, which was the marshmallow wet kisses. Actually, we put too much alcohol in those, so they didn’t really work! The wet kisses are made of methyl cellulose to emulate the marshmallow, which is a wetland plant. In terms of oil, one of the big issues in the gulf is that there are many people calling to protect the wetlands from the spill. That’s a very understandable position to take, but I take a completely opposite one, because the only technology we know of that can effectively digest large amounts of petrochemical waste is wetlands. So we don’t need to protect the wetlands — instead, we need to expose the wetlands and also build many more wetlands, and reconstruct the ones we’ve destroyed, in order to deal with this spill. Obviously, this really takes issue with the legacy idea that we have of conservation and preservation and environmentalism — that idea of preserving what’s left of “pristine” natural systems, without recognising that they’re not outside of our socio-ecological system. In other words, there’s no such thing as a pristine system. It’s a big challenge to introduce this new form of environmentalism, which is one that’s reconstructive and generative as opposed to conservative and preservationist. Wetlands and wetland digestive processes are a theme that keeps coming up throughout the menu. In California, over ninety-five percent of the wetlands are filled and degraded and in the U.S. in general, that figure is about sixty percent — and there’s ongoing wetland loss. Much of it is filled for agricultural reasons, but there’s an increasing amount of urban pressure, too. And, of course, airports are almost without exception built on cheap, flat land proximal to city centers, which is more often than not swamps and bogs — or what we now call wetlands. In the wet kisses, by using marshmallow and rice — rice, by the way, is the most important caloric source of food for humans in the world — we point to the fact that wetlands are by no means non-agricultural spaces. In fact, they produce more biomass per square metre than the terrestrial ecosystem equivalent. 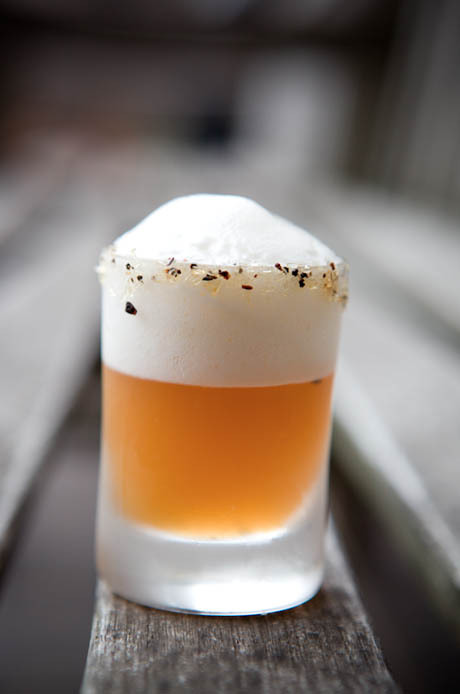 The wet kisses are an edible cocktail. They’re purple, using crème de violette, to evoke the purple-enhancing capacity of the lividium soil bacteria and the violacein that it produces. Lividium is a soil bacteria that is associated with wetlands, but it’s also associated with the microbial skin community of the frogs and salamanders that have survived the chytrid fungus, which is one of the major culprits in the biggest species extinction crisis the earth has seen since the dinosaurs — the extinction of amphibians. When it’s on the microbial skin community of frogs and salamander, the lividium soil bacteria produces this purple violacein, which is actually a substance that’s under intense medical research for a whole lot of other reasons. So when you eat it as a marshmallow, your lips are innoculated with the lividium and the violacein, which equips you to kiss a frog and innoculate it with the protective agent against the chytrid fungus. Mihir Desai: I should mention that, for now, the violacein is not actually present in the wet kisses. It is available as food grade chemical — it’s used industrially as a purple dye — but I’m still trying to find a source that will get it to me in small-enough quantities. 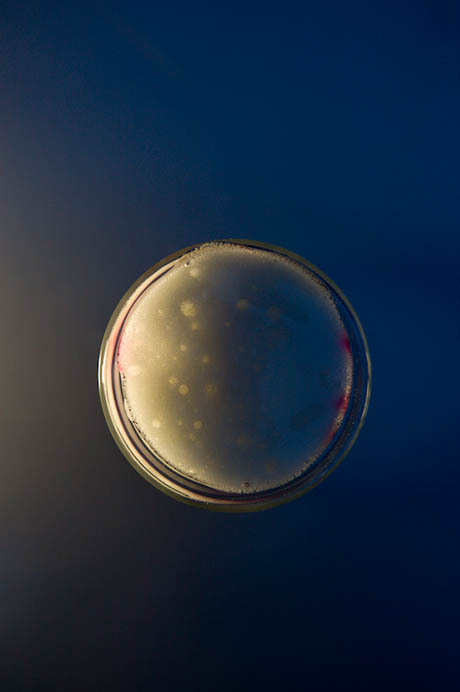 Natalie Jeremijenko: And, as I said, we did put too much alcohol in, so the methyl cellulose didn’t really whip up very well, but I think failed experiments when you’re doing a workshop are just as good as successful ones. Mihir makes everything look easy, usually, so it’s actually good when occasionally things don’t exactly work out. The other edible cocktails we did involved inverse spherification, which is a classic introduction to molecular gastronomy. I call them terrestrial bubbles. Mihir Desai: The spheres show off a technique of making an egg yolk, basically, out of any liquid by using sodium alginate, which is a seaweed-derived gelatin product. We had a workshop for two hours before the dinner, and during that people made these spheres for themselves. It’s not too complicated. The reason Natalie calls them bubbles is that they are sort of the inverse of an air bubble underwater — the kind you make when you go underwater and you breathe out. These are the opposite: they’re bubbles of liquid in the air. It’s a nice introduction to start thinking about terrestrial versus aquatic environments and where we fit in. Natalie Jeremijenko: They also create a membrane effect that weeps — we did a beet version, so you could really see the weeping. Then by soaking it with an alcohol, we can also have a membrane exchange going on. And they’re so much fun to put in your mouth and pop! We also had the edible lures, of course. We’ve taken commercial fishing lure moulds and filled them with gin and tonic, with a bit of rosemary in it. 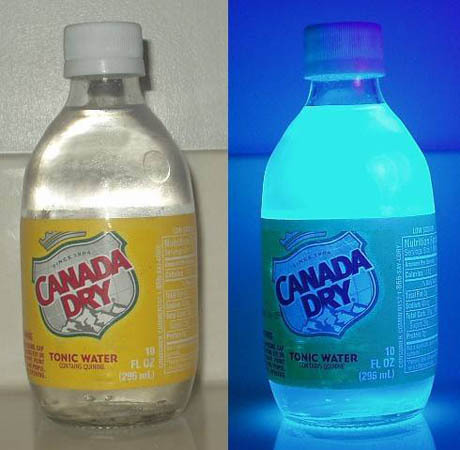 I don’t know how much the fish like gin and tonic, but people do, and tonic fluoresces wonderfully well. We use gellan as the base for the lures, which makes them edible for fish, so you can share it with them. It also has a chelating agent in it — the chitinase. That’s an extract from chitin, the second most plentiful form of material in the world after cellulose. Oysters, lobsters, and other invertebrates use it as their structural base. As a molecule, it’s very inert and very stable, and it will grab a lot of material. When either people or fish ingest it, it binds to the bio-accumulated heavy metals and PCBs. There’s no other way to get them out — you can’t slice mercury out of a fish, or prepare it in a way that removes the PCBs. Fish are the greatest source of mercury in our diet — between eighty and ninety percent of the mercury in our bodies is from fish. By feeding fish the lure with the chitenase in it, it binds to the bio-accumulated mercury and PCBs, and passes out as a harmless salt. It’s much less reactive and much heavier, so it settles into the silt and is effectively removed from bio-availability. We are using this as a kind of emblematic example of the feedback cycle: you transform the food of the fish, and then we eat the fish. Our approach is rather like targeted drug delivery, rather than treating the whole system as they’re doing up the Hudson by dredging all the sludge and shipping it off to Texas or to Pennsylvania or to the nearest Third World country where it continues to be toxic sludge. 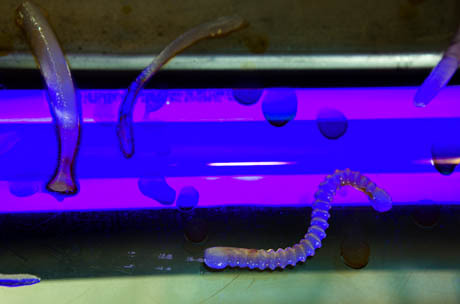 Instead, we’re using the bio-amplification that happens through the food web. 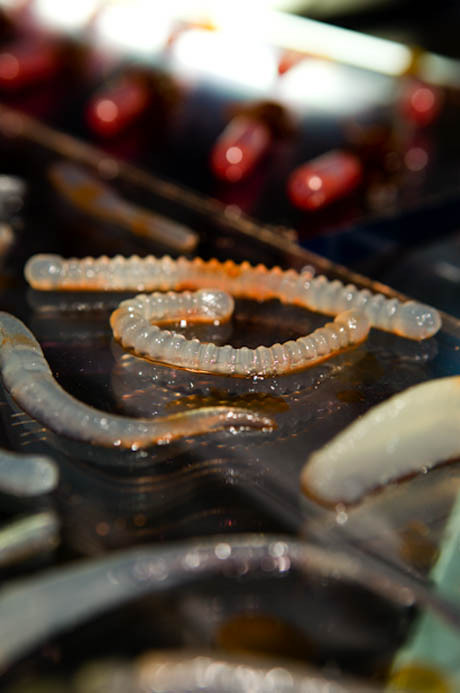 The place where the toxins are most accumulated is in the bodies of fish, so by delivering the chelating agent to that point, we’re doing a very focused intervention. We’re addressing their health and we’re augmenting their nutritional value and resources, which we depleted in the first place with an urban design of hard edges and no shorelines — the cumulative urban impact on the aquatic ecosystem. The lures are really the iconic example of the Cross(x)-Species project. It changes the interaction. If a busload of people started feeding these lures to fish, regularly, you would create sites where fish are there, and people learn that fish are there, and fish learn that people are there and when people are there, food is likely to appear, and you start this feedback cycle through which you can actually have an aggregated and significant positive environmental effect. The chitenase acts biologically in our bodies in the same way it acts in the fishes’ bodies, so there’s also that fundamental lesson that we’re biologically not that dissimilar. And then it has an indirect effect on our health, because by improving their health and augmenting their nutritional resources, we’re improving our own. Edible Geography: It’s a perfect demonstration of the fact that if you expand your understanding of the food web, you can choose a more effective point to intervene. Natalie Jeremijenko: Exactly. People in natural systems are always seen as a negative, but in an urban context where you’ve got a tremendous number of people, I think that the design challenge is to figure out how to use that resource. If you don’t give those people a nutritionally appropriate chelating lure to feed the fish, then they’re only going to throw cigarette butts or Doritos or chewing gum or something in the water. It’s a particularly urban design challenge, to transform our relationship with the ecosystem to become a form of cultivation rather than extraction or damage. We live in an incredibly rich ecosystem in the New York/New Jersey estuary system, and if we redesigned the nutrient flows — if we redirected fish waste from landfill, for example, and cycled it back into the estuary system, and supplemented the nutritional resources that are available, and designed those nutritional resources so that they actually are generative, we could really foster a dense, healthy, urban population of fish. I like to think of New York as the New York of fish, aquatic organisms, and birds before it was the New York of people. It had the same kind of incredible carrying capacity and ability to sustain huge populations. 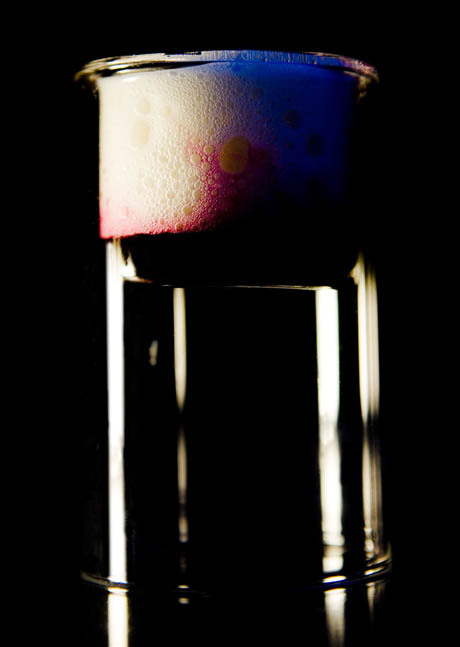 Mihir Desai: The cocktails and the first course were also a really nice introduction to the techniques that make molecular gastronomy interesting — spherification, liquid nitrogen, turning fats into powder, gellan, and so on. For the first course, we set the yuzu juice with gellan gum. Gellan is fantastic — it’s a synthetic product and you can get it in different strengths, so, unlike agar, it can set all the way from a soft, sort of chewy gel to a hard, brittle one. In this dish we had a yuzu gelée with a tomato marmalade on top, and olive oil in powdered form. Natalie Jeremijenko: Which melted in your mouth. Mihir Desai: To make the oil into a powder, we used maltodextrin, which is a modified food starch. Unlike most starches that you’re probably familiar with, which soak up water, this one soaks up fat. By using maltodextrin, you can pretty much powder any fat, even though fats are notoriously difficult to powder. The other way around making a fat into a powder, if you don’t already have it in liquid form, is to freeze the material using liquid nitrogen, and then just smash it. So we also did that with some olives that we served for this course. Natalie Jeremijenko: That was interesting, because the first part of the breakdown of oil is a mechanical as well as biological process. 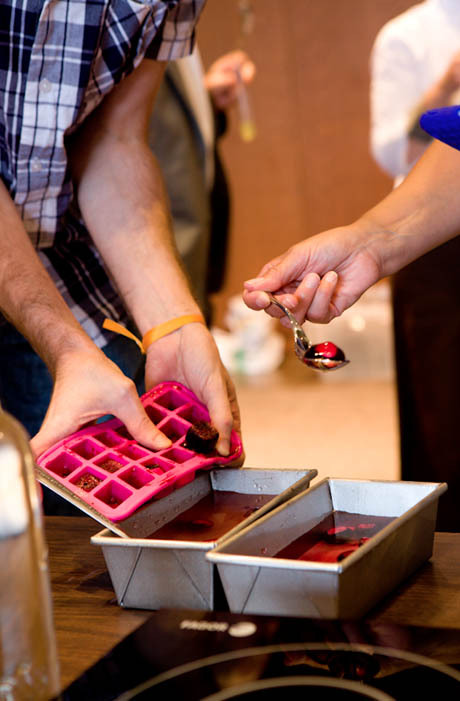 Throughout the dinner, the dishes explored the different possible states of oils, the ways oil and water combine, and how you can grab and break down oil. As Mihir explained, maltodextrin grabs the oil mechanically and makes it available to a number of other processes. Maltodextrin is extracted from tapioca. Processing cassava or manioc — again, another extremely important food that huge populations depend upon — to extract the tapioca starch is very interesting, particularly in terms of the precision with which the cyanide is removed by what we might think of as very primitive methods, such as pounding and drying. In the lab, we would typically require liquid chromatography to achieve this level of precision, but Africans and South-East Asians traditionally do it entirely by taste. And talking about this allows us to make the point that taste is actually a very precise tool with which to guide our eating. It’s a very important tool of investigation. The yuzu has some of the protease, bromalain, that pineapple is famous for. Bromalein can hydrolise protein, which is why you can tenderise meat with pineapple and you can’t put pineapple in Jello. So that functioned as a second stage to break down plant and bacterial proteins. We served the first course with a sake. 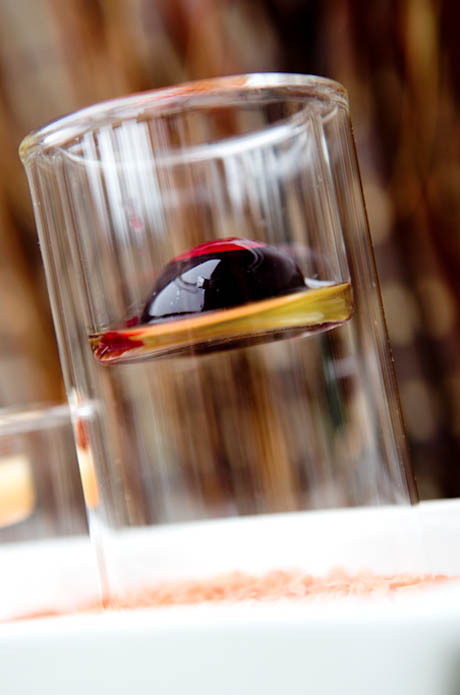 If alcohol is some sort of measure of biological conversion processes, sake is the most alcoholic of all the drinks, because it has three different biological processes, including the yeast, the fermentation, and the bacterial transformation. Edible Geography: Describe the second course. Mihir Desai: The second course was really about Natalie’s idea of urban meat — urban-appropriate, alternative protein sources that are usually considered disgusting but could easily not be so. In this case, we had snails, which oddly enough, she won’t eat. Natalie Jeremijenko: The centrepiece was a snail rollercoaster, and underneath the table we had embedded some video of snails, which had been sped up to human-recognisable speed. Snails provide a number of interesting analytic points. For a start, there’s the relationship with Slow Food, the symbol of which is a snail. But what brought me to snails is the fascination with what is viable in terms of urban agriculture. It was also sort of a test. It was the first time we’ve served meat at a Cross(x)Species Dinner. I knew we had a lot of vegetarians there, including myself — I’m a vegan, largely. So the question was, if you could produce a meat in which the organism lived a long full life and its cultivation actually improved environmental health and augmented the local biodiversity, contributing positively to the local ecosystem, would that basically be a vegan meat? In moral philosophy, in the history of the twentieth century, you have the utilitarian approach and then you have this other interesting strand, in which a simple rule just doesn’t cut it for figuring out what’s right. The particularities really matter. From a systems analysis point of view, I would posit that snail is the most viable urban meat. It has a long gastronomic history, of course — which I’m actually trying not to engage with. I think that traditional recipes for snails are horrible, and the whole process of disgorging them is really awful. Perhaps the most poetic aspect of the entire Cross(x)Species Dinner was that instead of flushing them with cornmeal, which is the traditional way of preparing snails — to flush out their digestive system — we fed them for the last few days of their lives on parsley. They were self-flavouring, if you will. You could taste their last meal, which is quite an interesting thing. In any case, the idea behind using snails as an urban meat is because they don’t need horizontal grazing. They’re vertical animals; they’re upwardly mobile. Snails can navigate the vertical surfaces that make up our urban context. 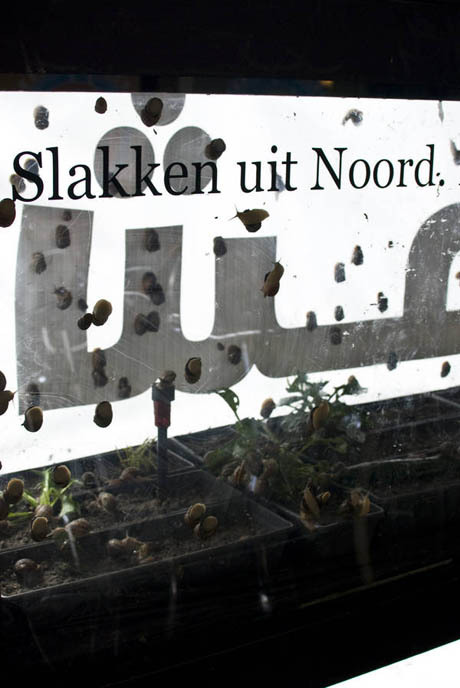 IMAGE: Wietske Maas’ “Snail Farm” via Mediamatic. Unfortunately, urban agriculture is plagued by the most ridiculous ideas. The idea of vertical farm skyscrapers, where we take the most expensive genre of structures we’ve ever created as a species, and imagine that we can build them to grow carrots and tomatoes… it just doesn’t even begin to be feasible. I get so cranky because it misses the point completely — which is that, opportunistically, we do have a lot of vertical space, so how do we inexpensively and effectively integrate vegetation and food production into that existing infrastructure? At the xDesign Environmental Health Clinic, we’ve been doing a clinical trial of these AgBags that we’ve developed. Essentially, they are a Tyvek bag that hangs either side of a windowsill or railing, which has soil moisture retention and allows you to grow a number of different crops. We’ve been experimenting with potato / tomato plants and a couple of other things — nasturtiums are one of the things we’re trying, but there’s a bit of controversy about whether or not the snails really like the nasturtiums. They look beautiful in salads, though. IMAGE: Jeremijenko demonstrates an AgBag in Boston, via. I’m trying to do a whole section of edible flowers, actually. I really like exposing the sexual organs of plants and eating them and understanding them. Nasturtiums also provide for a lot of insects and pollinators — they make a very evident display. We have some growing at NYU Housing on the fourteenth floor, and it’s amazing the insects you get up there. But importantly, what the AgBags also do is create urban grazing. One of the interesting things I’ve learned is that most of the food in the world is still produced by small farmers, who grow grain as their primary crop, but then graze animals within that plot too. The farmers intentionally share between one to five percent of their crop with the animals. These methods of intensification are used all over the world, in the majority of global food production — in Indonesia, in Africa, and so on. The grain is shared between the humans and the animals, and then the animals are the insurance for crop failure. 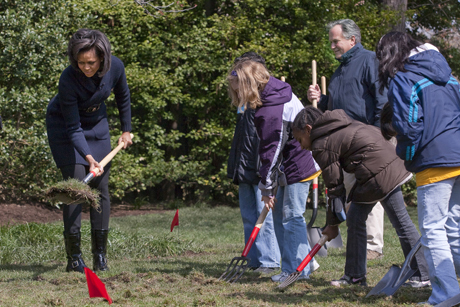 IMAGE: Michelle Obama digging a vegetable garden, via. This whole problem of most urban agriculture, which can be summed up in that iconic image of the First Lady holding her seventeenth-century pitchfork in a vegetable garden, is that the Luddite rejection of any possible innovations or intensification just does not bode well for viable urban food production systems. I love community gardens, but they’re always under threat, they’re always oversubscribed — horizontal urban space is very contested, but vertical space is not. The AgBag system is modular, so you can connect to your neighbours upstairs, downstairs, and sideways. It can sort of metastasize, and the more you have, the more effective the irrigation is — there’s a rain guide that goes between the two. So they are a viable, cheap, parasitic, modular way to take advantage of existing uncontested space for food production — but you still have to find a way to intensify it. The snails are a viable way to incorporate intensification and meat production with vertical grazing. In other words, with an AgBag, you’re both growing plant-derived food and providing the optimal habitat for snails, because of the moisture retention and the design, but also because you share some of the crop with them. 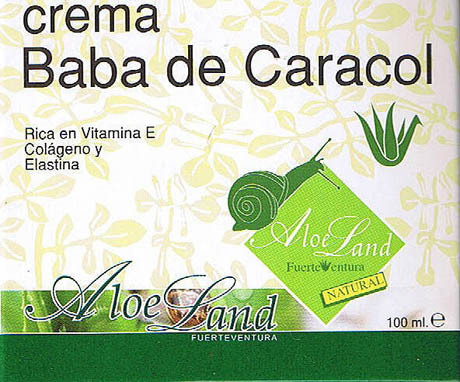 IMAGE: Spanish snail-slime cream, via. The other interesting thing about snails is that you can milk them. There are actually a number of very expensive snail-slime face creams on the market. They take snails and agitate them and then they use the slime as the major component of these collagen-building, anti-oxidant-rich creams. That’s a very high-end product that you can get from the snail, with minimal effort — but that’s still not enough. We wanted to find a way of actually making urban agriculture pay for itself. So what we’ve done with the clinical trial that we’ve launched is a package that has the AgBag in it, the snails, the plants, and these Brinno cameras, so that you get a timelapse of the snails. It translates their daily activity into a minute of footage, which just becomes fascinating, because they’re such extraordinary creatures with an incredible sensuality. You see love triangle dramas, you see them wrestling each other — you see a whole soap opera of entertainment going on. That’s another layer of added value, but then to really monetise it we also superglue RFID tags on the snails that we issue to people. We’ve put an RFID reader at the bottom of the fourteenth and seventeenth floor sites that we are currently testing. We release the snails at the bottom and they make their way up to the top, and we take wagers on which snails are going to win. It’s sort of like horse-racing, where the bet-making is the thing that drives the industry. Edible Geography: Of course — the gambling industry is much more lucrative than farming! Natalie Jeremijenko: Yes, exactly. So we’ve created this very fun thing — we get daily and weekly updates on the great snail races, and we announce the winners, and so on. And then, of course, that poses a really interesting systems problem, which is if you have this performance information on the snails, do you eat the slow ones or do you eat the fast ones? Are we setting up a system where we have the synthetic evolution of faster snails? It’s like the Olympic Village effect you see with cane toads. It’s really remarkably evident in the moving front of invasive cane toads in Queensland, where I come from. There are the cane toads that are happy where there are, and then there are the ones that are pushed out and are finding new territory, at the front. Of course, the ones that are moving and hopping are interbreeding, so the moving front is now something like three times faster than the cane toads that are not territorially advancing. They’ve got longer legs and larger muscles — it’s like the Olympic Village interbreeding to create these hyper-performing, extraordinarily fast, super cane toads. I think I’m alone in this debate on the side of wanting to breed the fast snails. Edible Geography: Surely the fast ones would have more lean muscle mass to eat? Natalie Jeremijenko: Well, yes — and we could market the Manhattan snail variety, sped up for life in the fast lane! It is also just really interesting to me that snails challenge our time frame — they challenge our ability to perceive and recognise complex adaptive systems. In any case, this particular experiment in snail agriculture is both an experiment in intensification and diversification and an attempt at improving environmental health. It starts to articulate what these new urban food systems could look like — but it rests very critically on branding these new and novel foods as delicious and desirable. Frankly, when I start talking to people about snail meat, most people say “ugh” — it’s not really something that most people associate with deliciousness. For lots of people, it’s associated with bad cafés in Paris on package tours, and lots of oil and butter and so on, rather than with these extraordinarily pleasurable creatures that lead epic, dramatic lives that you can review in a minute each day. Natalie Jeremijenko: Ah. Yes. This was a test of the concept of a vegan meat, as I said. And actually, everyone did eat the snails, except for me. I’m just so attached to them at this point. In any case, the snails are a really big experiment for us, and so that was one of the things we were showcasing alongside the oil spill and wetlands theme. 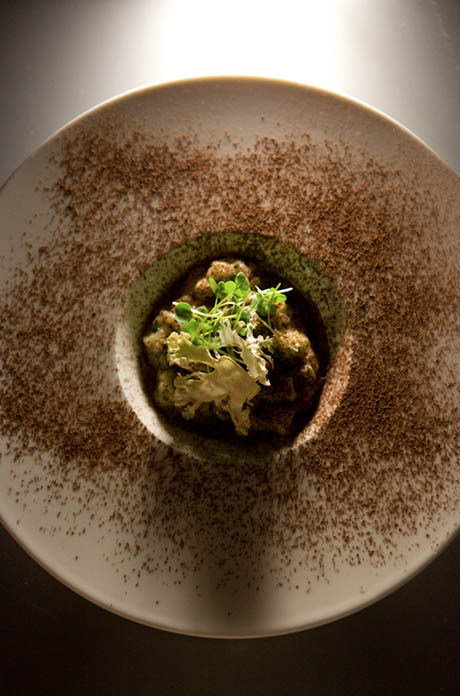 Mihir Desai: Flavour-wise, this snail course was a take on the classic sausage and sauerkraut food pairing. The mustard was a Dijon ice cream, which was made with nitrogen, the sauerkraut was a cabbage gazpacho, and the snails were served in a fricassée with Brussels sprouts and brown mushrooms. I really liked the plating of this one: we had it on slate, and the snails were on the right. Emilie Baltz made porcelain bowls out of gas masks, right after the first SARS thing, and they’re beautiful — she had something like 150 of them on the wall as an installation. But we’ve been using them as soup bowls. So we had the ice cream in the bowl and then a pitcher of the gazpacho for people to pour around it. It was also a way for Natalie to talk about her air quality work, because of the gas masks. Ideally, I wanted to make that aspect more obvious by smoking the snails, but one of the plating service pieces didn’t make it up to the museum. We were going to serve the fricassée under a cloche that would have been pumped with a flavoured air, and people could have opened the cloche at the table. With the snails, we served the Cour-Cheverny, which is a highly acidic wine from the Loire Valley. It’s really interesting because the grape that it’s made from, the Romorantin grape, nearly went extinct in the 1980s — there were no significant wines being made from it and all the vines were dying. Then, in the early nineties, a bunch of French vintners got together and decided to make this new appellation to save that grape. It’s 100% Romorantin grapes, it’s a phenomenal wine, and actually in the late nineties they even achieved AOC status. Edible Geography: That example of a successful revival makes it a good match for the snails, which also need to be rebranded. Mihir Desai: Exactly. And it’s highly acidic, so it goes well with the sour of the cabbage too. The next course had an earthy theme. This was probably the most popular course in terms of flavour. 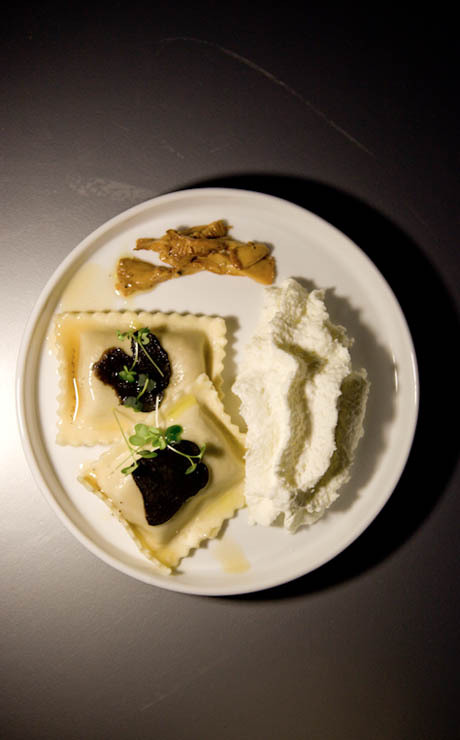 There was a ravioli of gorgonzola and walnut, and atop that we put black truffle slices. The shallots were on the side with a parmesan foam and a basil sauce. Natalie Jeremijenko: There are a lot of people doing interesting work on myco-remediation — for example, Phil Ross. I’m also interested in foraging versus cultivation — foraging is extractive, and I’m interested in changing foraging practices into cultivation practices. That’s the research direction we’re going in with truffles, to try to get to the point where you’re cultivating the larger ecosystem as opposed to trying to monoculture the particular fruiting body of the truffle. But that’s a longer story and much less developed than some of our other projects. 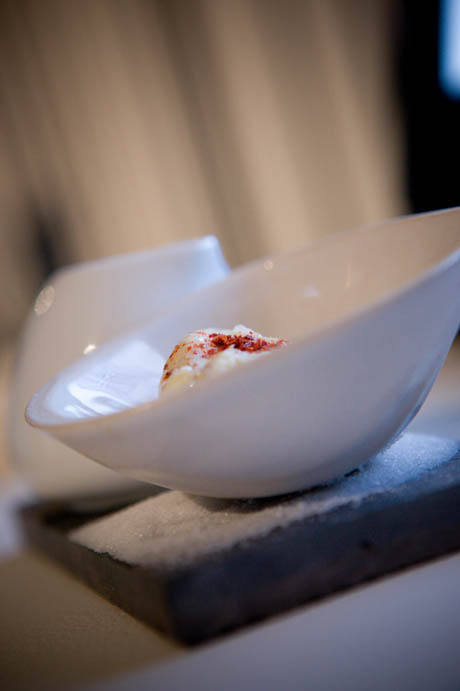 Mihir Desai: The cocoa and cauliflower course was based on a Heston Blumenthal pairing. A few years ago, Blumenthal went round his kitchen and tried different ingredients, just to see if he could find new pairings. One of the ones that worked best was white chocolate and caviar, which is in fact an amazing pairing. He also sent away something on the order of six or seven hundred food products to a local chemistry lab, and they ran all these chemical tests to find out what the olfactory compounds were. White chocolate and caviar, it turns out, actually have very similar profiles. Now there’s this database with ten thousand different profiles, but a university owns it and access to it is something like eight or nine thousand dollars. Nonetheless, a few profiles have leaked out and there are some smaller lists that are available, and one of the more unusual pairings is cocoa and cauliflower. In this case, the cauliflower was in a bunch of different forms. It was in a velouté of cauliflower, and a cauliflower risotto, which we made with cauliflower stock and cauliflower cream with dehydrated cauliflower on top. There were also slices of the cauliflower stock, and atop we sprinkled cocoa dust. One of the things that we wanted to do at this dinner, but weren’t able to because our circulator is still on order, was serve offcuts. The one that I know most well is an under shoulder cut. Traditionally, butchers just threw it out because it’s too hard to separate and then market it, and anyway, no one knew how to cook it. But at Dickson’s Farmstand, in Chelsea Market in New York, there’s a very young, brash butcher who’s very much into these alternative things and he started selling it. We worked on it for a couple of months to try to cook it well, and it turns out that if you circulate it at a really low temperature, it’s actually as tender, if not more tender, than filet. It’s super juicy — it’s very hard to make it unjuicy — and it’s ridiculously cheap. At one of my dinners we served it with filet side-by-side, and people could not tell the difference. This is a cut that the beef industry in the last year has decided to re-market as a wonder meat, but for decades it’s just been discarded. There are ways to get around not having a circulator, but they’re not going to be as exact. One of the wonders of a circulator is that you can cook meat at very precise temperatures to get to certain textures that you could never get to before. For instance, salmon has this cooked state that actually tastes as if it’s raw, even though it’s completely cooked through. That’s something you could only achieve with a very exacting circulator. 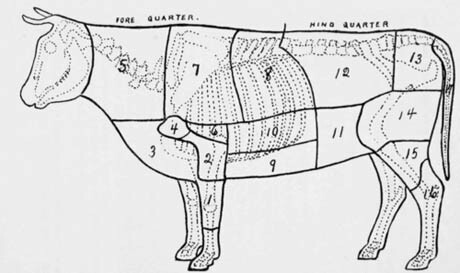 IMAGE: Diagram of beef showing principal cuts, via. Edible Geography: How does the industry recommend that people prepare this under shoulder cut? Mihir Desai: By grilling, which leaves it a little tough. I think generally they recommend overcooking it and then shredding it, kind of like a fajita. But it’s a really good piece of meat, so I don’t know why you’d want to do that. We were running short of time, so we also didn’t do the make-your-own oil spill, unfortunately. It was intended a palate cleanser to be served before dessert. We had a strict curfew with the gallery. It was going to be a lemon gelatin with a black oil that was made from currants that was to be served on the side. Then there was also a little iceberg that was made from vacuumed coconut milk — you put the coconut milk in a siphon, then you vacuum it to make it rise and expand the bubbles that the siphon put in, and then you freeze it so it’s basically this bubbly mass of white, which we shaped into an iceberg. Natalie Jeremijenko: But at the dinner we also launched our prescriptions for water buffalo ice-cream subscriptions. These came out of another piece in the exhibition: the “How Stuff Is Made And How It Can Change” encyclopedia. All of my students at NYU have to trace one product all the way through the manufacturing process, and then offer a viable innovation to improve any or all aspects of the production system. One of my students studied Ben and Jerry’s ice-cream, and looking at the dairy industry is just an extraordinary adventure. There are the same number of cows in the U.S. now as there were in the twenties, but each cow produces ten times more milk. It’s just an incredible measure of the force of industrialisation. While the really large dairy producers are out in California, more than a quarter of the milk produced in this country comes from Vermont and its immediate neighbours. Within that landscape, Ben & Jerry’s is a progressive front for Unilever, who bought them a few years ago. Unilever is continuing a lot of the things that Ben & Jerry’s had originally done to use ice-cream as a medium for social ventures. But now it’s actually Unilever behind the brand, and looking at their operations — it’s shocking. 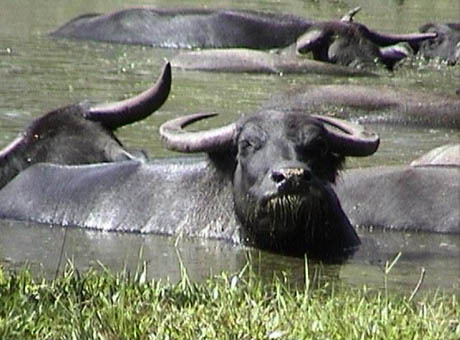 IMAGE: Water buffaloes, via Wikipedia. It’s a very interesting comparison. Water buffalo milk is actually the milk of choice in buffalo ricotta. Apparently the Romans brought over water buffalo from India and knew that the luxury, creaminess, and high-protein, high-fat content of water buffalo milk makes for the best ricotta. Our idea is that making a delicious water buffalo ice-cream line creates the demand to farm this animal, and, in turn, water buffalo have ecological demands, which include wetlands. They require wetland grazing. That’s actually part of why their milk is so rich — because wetlands produce so much more biomass by area. And, of course, wetlands are one of the ways that we can treat some of the range of horrible environmental complications that the dairy industry produces. 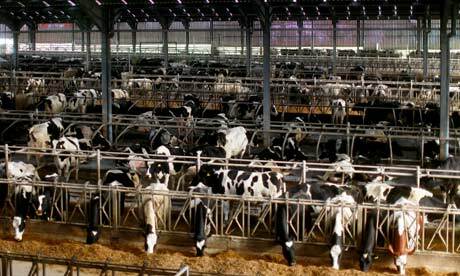 IMAGE: Industrial dairy farm. Photo by Graeme Robertson for The Guardian, via. In the first place, there are water usage issues: there are some estimates that it takes between seven and fourteen cups of water for every cup of milk produced in the dairy industry. Then there is run-off from the sprayed fields and the cesspools. The cheap, ubiquitously available, and effective way of dealing with that is to create constructed wetlands. Most people don’t realise that the processes used in water treatment facilities are simply simulated wetland technologies, deprived of much of their effectiveness and biodiversity. In any case, wetlands are simply an extremely useful ecosystem for sequestering carbon dioxide, protecting the aquatic ecosystem, and recapturing nutrients before we lose them and create big algae blooms in marine ecosystems instead. Around California and Vermont — both big dairy states — and other places where there are shallow aquifers, the wetlands also infiltrate and recharge the aquifers. They do all these good things that we need them to do. By creating a prescription for water buffalo ice-cream, we’re creating a demand to diversify the dairy industry and to create a system where an infrastructure of wetlands is actually constructed to provide water buffalo grazing for each of the dairy production facilities and to deal with the ecological waste that dairy farming produces. It produces more milk for the farmer and gives them another market, and then it also addresses the regulatory compliance issues associated with conventional dairy production. We’ve been asking Ben & Jerry’s to take this on as their next progressive thing, and to use this to influence Unilever. Of course, this whole idea hinges on creating an extremely delicious ice-cream. We’ve actually used the liquid nitrogen method to create nano-crystals, so we call it nano water buffalo ice-cream, to get that extra smoothness that, I think, amplifies the creaminess of the water buffalo milk. Edible Geography: Have Ben & Jerry’s responded with any interest? From talking to them, where we’re at now is the idea that we buy the buffalo and actually get urban support for people to own the buffalo that the farmers will house, so that the farmers can toy with the idea of working with these animals without taking on all the risk. Edible Geography: It’s sort of like a CSA system for water buffaloes. Natalie Jeremijenko: Exactly. But it starts off by demonstrating that there is interest and by creating the demand with this prescription subscription, where we’re asking people to sign up to receive a different flavour every month. We have a small-scale source of water buffalo ice-cream to start with, just to get the ball rolling. It’s precisely because Unilever uses the Ben & Jerry’s brand to hide an extraordinary amount of very unprogressive practices that there’s an Achilles heel that we can use to get in and influence a huge corporation. To have Fonterra, the biggest dairy producers in the world, asking for a report on water buffalo is pretty exciting. The charge of the Cross(x)Species Adventure Club is to explore new food and food systems that will improve environmental health and augment biodiversity. 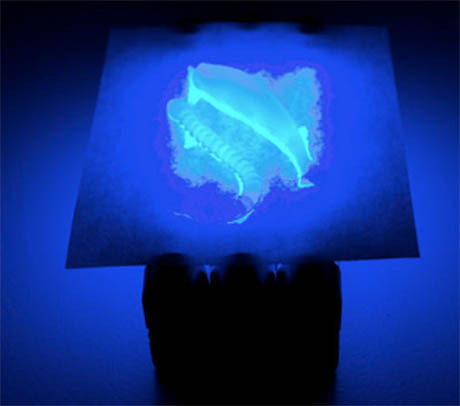 With the snails, the water buffalo ice-cream, and the bio-augmentation with the lividium bacteria — these are the kinds of projects where we’re really getting some leverage. Edible Geography: What role do the techniques of molecular gastronomy play in achieving the goals of the Cross(x)Species Dinners? What’s the connection? 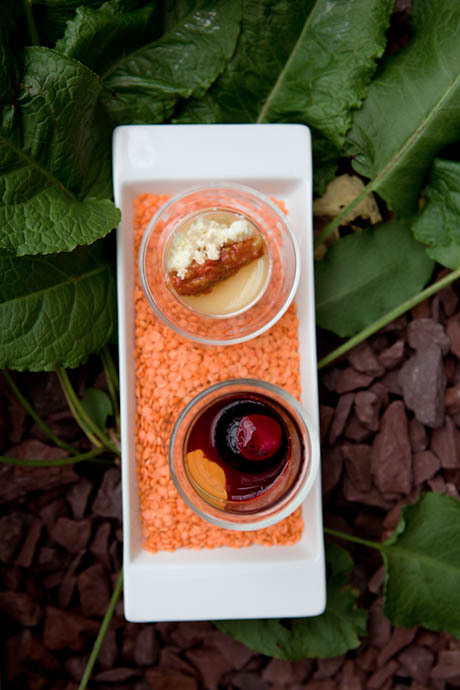 Natalie Jeremijenko: In molecular gastronomy, you really focus on the cooking and food processes, and those are often very similar, in micro form, to ecological processes. With oil, the emulsification variations at different oil/water balances is very interesting, and this is where the entire palette of texture — the foams and gels and ice-creams and fluid gels — of molecular gastronomy — is so important. Mihir Desai: Texture is one of the primary reasons to do most of this stuff. Some of the food combinations are new, but the vast majority are old and have been done so often that one way to make them new again is to change the textures of things and make them unexpected. I really like doing dishes that are just the textures of a single ingredient, so you get it in six or seven different forms. Each different chemical or process enhances a certain aspect of the ingredient and you get a better appreciation of the thing as a whole. Coupled with that is an idea of the purity of the product. For instance, if you want to make a puree, instead of doing it the old-school way where you stew whatever thing it is in either cream or stock for a long time, which dilutes the flavour, there are a lot of purer ways to get that flavour out. For example, a really easy way to make a puree of any vegetable at home is to juice it, and then put the juice in a blender with xanthan gum. 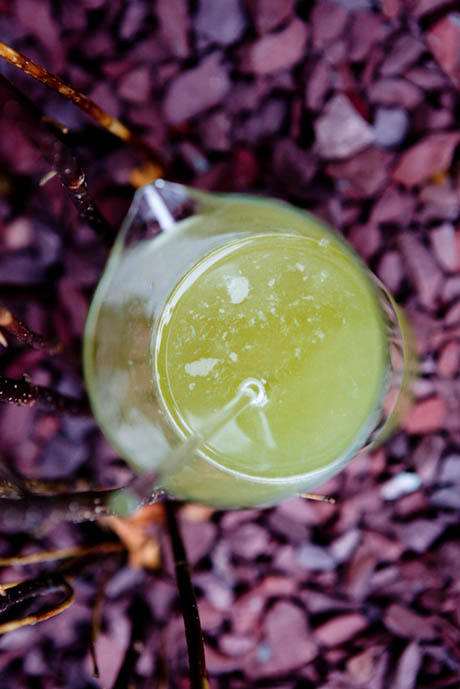 Xanthan has been around forever — it’s basically sap from a tree — and it will thicken any liquid into a puree. You can thicken it as much as you want, even up to the point where it’s more solid than Jello. We did that for the cauliflower, so that all you have is cauliflower — there’s no fat to mask the flavour or stock to dilute it. There are many other techniques like that, that allow you to extract pure flavour. Natalie Jeremijenko: I also think there’s something to the idea that the complexity of the tastes that people are experiencing makes them open to hearing about these complex systems and processes that they would otherwise not be motivated to hear. The take-home message about why we want to augment biodiversity and improve environmental health is quite simply that biodiversity tastes really good. As a paradigm, it has an emotionally vivid value that you can’t quantify. All of the environmental groups really struggle with quantifying the value of biodiversity. It’s very hard to measure the value of biodiversity when it comes up against how many jobs a strip-mining operation will create or how much power and economic stimulation another hydro-dam project will create. That’s what I think is most successful about the Cross(x)Species Adventure Club dinners as a medium, is that people really understand the importance of biodiversity when the intensity, and the complexity, and the sheer thrill of the food that they’re eating makes it so available in ways that you can never quite articulate otherwise. Mihir Desai: I’ve been working with Natalie on these Cross(x)Species dinners for a little under a year. One of the reasons her work appeals to me so much, and these dinners appeal to me so much, is that for both of us, the food is not the end point. Food is simply a starting point — in this case, for an amazing conversation about environmental health and systems. This is great! It is amazing that you can use food as a starting point in opening a discussion about our bodies and the environment!